In Uncle Cal Buck's Lenten devotional, he recounts his fear during the Korean War and a call to knock out an enemy machine nest. For his courageous action, Sergeant Calvin Buck received the Silver Star Medal, the third highest military decoration for valor. He sees his miraculous survival as a call to a life-long commitment to his Christian Faith. In Deuteronomy 31:6 prior to Moses' death, he told Joshua to be strong and courageous. "Do not be afraid or terrified because of them, for the Lord your God goes with you." Then why should we be afraid or have fear? He is always with us. He looks over us and guards us. helped me load the 57 Recoilless Rifle while the men who weren't pinned covered me as I stood up and fired. We did this three or four times until the enemy was silenced. When I look back at this incident, I know it was truly by the mercy of the Almighty God that my life was spared. As I grow older, I now know there was a reason for Him saving me. Now it is up to me to keep the legacy of Christian faith going in our family. God has a reason for each of us. The faith of Joshua carried him to the Promised Land. Then we too, with our faith, can have the promised land. See you in the New Jerusalem. 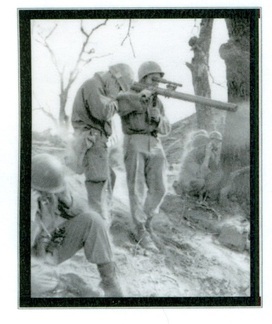 complete disregard for his own safety, Sergeant Buck, Squad Leader of a 57mm Recoilless Rifle Team, moved into a forward and exposed position. Firing with deadly accuracy, he destroyed the enemy machine gun nest, thus enabling his comrades to secure their objective with a minimum of casualties. Sergeant Buck's courageous action, unswerving determination and selfless devotion to duty reflect the highest credit on himself and the United States Infantry. Entered military service from Goodhue, MN. "